Ideal Standard ... next-gen tap technology. Ideal Standard’s new Ceraflex range represents the next generation in tap technology offering a high standard in bathroom and kitchen fittings while featuring a minimal and modern design. “Invented in 1969, the ceramic cartridge has been refined over generations to reach optimal reliability and durability. The result is a cartridge that will last nearly twice as long as the industry standard: 500,000 cycles, offering double the lifespan of regular, daily use,” he says. Furthermore, the mixers come with integrated special regulators that provide five-litres-per-minute flowrate without compromising the water volume. Over time, this can mean major savings for hotels, public areas and the household. Ceraflex also features the hot water limiter, which allows control over the maximum temperature of hot water and therefore prevents scalding. 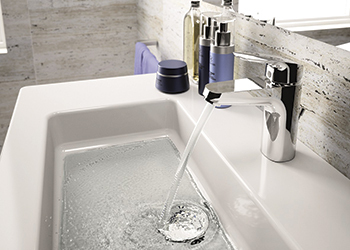 With the integrated temperature pin, water can be reduced at any given time. With just a simple lifting and balancing of a red plastic ring in specific positions, the handle’s range of movement is delimited and maximum temperature reduced, the spokesman says. The range also comes with Ideal Standard’s EasyFix system, which helps save 30 per cent on installation time. The new Ceraflex mixers is available as an aesthetic and efficient addition to sinks, basins, bidets, baths and showers. It comes in rim-mounted, wall-mounted and built-in configurations, to suit all needs. LG Electronics (LG), in partnership with its exclusive distributors Al Yousuf and AJM Kooheji, has launched across the UAE and in Bahrain respectively its latest state-of-the-art residential air-conditioning solutions that feature its innovative inverter technology. The next-generation Dualcool air-conditioning solution ensures optimal cooling performance, energy efficiency, cleaner air and durability, says the company. “LG always presents solutions with innovative technology at the core, technology that is carefully crafted and developed for what matters most - the family,” says Yong Geun Choi, president of LG Electronics Gulf. The Dualcool works even up to 65 deg C, thanks to its dual inverter compressor for which LG offers a 10-year warranty. Additionally, the air-conditioner maximises cooling performance, providing 60 per cent faster cooling and 20 per cent more cooling, while saving up to 65 per cent of energy compared to conventional units. Another key feature of the Dualcool is that it offers a ‘smart diagnosis’, which allows users to remotely and conveniently check set-up, installation, troubleshoot, and other information directly from a smartphone via a SIMs module. The Dualcool has LG’s exclusive Gold Fin coating, which forms a protective shield on the surface of the heat exchanger. West Elm, one of the world’s leading home retailers, has opened its first furniture store in Qatar at the Doha Festival City (DFC). The US-based retailer said its new store offers a vast freedom of choice to its Doha customers. From sectional sofas and love-seats, to dining, bedroom, beddings, decorative accessories and home office items that span across mid-century, industrial and contemporary design spectrums, the first-of-its-kind showroom provides furniture that fits every style and space, says the company. The New York-based home retailer offers a mindful combination of modern design and affordability to Qatar’s home owners and families, with a rich selection of organic, handcrafted, sustainably-sourced products and home design services, says a top official. “We are really excited about marking our first footprint in Qatar and we can’t wait to fuse our creative minds together with our clients as we empower them to build and design a unique space that they can truly call ‘home’,” remarks Amminuddin Abdul, West Elm Doha’s general manager.